Home News Attention! World Last Male Rhino needs to mate. Attention! 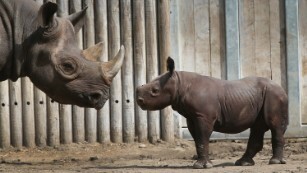 World Last Male Rhino needs to mate. 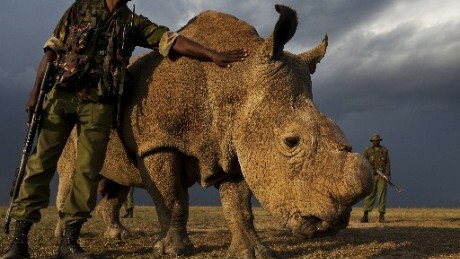 The world's last white male Rhino, located at Kenya, desperately needs to mate. In order to achieve this, that is to make a last-chance breeding effort to keep his species alive he has been added on the Tinder, a dating app. His profile says "I perform well under pressure." Campaign is already being carried out by Kenyan wildlife called "The Most Eligible Bachelor in the World". 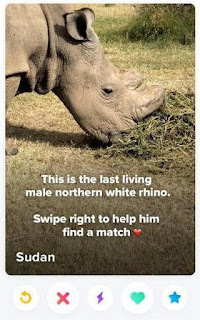 Users have swiped right in such numbers they crashed the donation website hours after the rhino's profile went live. Special privileges have been given Sudan and Tinder has made him a profile available all over the world. "It's going to be broadcast in 190 countries and in 40 languages," says Mathieu Plassard of communications agency Ogilvy Africa. "(It's) the first time that Tinder has done something like (this)." The 43-year-old Sudan has failed to successfully mate with the two female northern white rhinos left and the conservancy is seeking funding for in-vitro fertilization (IVF). Donations is already going on and are being processed by Virgin Money in the US by CrowdRise and in Kenya by popular mobile service MPesa. This will help pay for the ongoing research into Assisted Reproductive Techniques (ART) conducted by institutes in the US, Germany and Japan and if plan goes well, scientists hope to create a herd of 10 northern white rhinos after five years of IVF treatment.